I know it feels like I've abandoned you. Up until a few weeks ago, you were my go to source for entertainment. When I had a few hours to kill and I wanted something I could count on, and I didn't want to put up with commercials, you were my first and only destination. I could throw in a disk (and by that I mean carefully transfer the disk from the case to the player to avoid scratches and extend the life of the DVD) and whether it was a movie or a favorite television show, the result was enjoyable all the same. Sometimes I would sit back and re-watch a movie I'd seen dozens of times already. Or I might have some busy-work or chores to do, and the familiar television characters would keep my company during my drudgery. It was a solid system, one you feel I've betrayed because now I have Netflix and Hulu Plus. 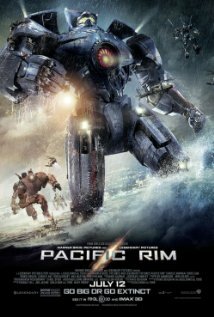 Pacific Rim is about giant robots punching giant monsters in the face. If any movie deserved the "shut up and take my money!" treatment, it's this one. My wife and I saw it opening day, and we sat right in front because my inner 12 year-old demanded we sit up close to the action. There are times you listen to that 12 year-old, and if this isn't one of them, I don't know what is; if there's one movie about robots punching monsters that you see on the big screen, it's this one. What the grown-up side of me enjoyed was the exploration of that world and its culture. The movie takes place about a decade and a half after these giant monsters (Kaiju) have started showing up and doing to our cities what rock stars do to our hotel rooms. Once the initial shock wore off, the presence of Kaiju became a normal part of the world. People learned to adapt to the reality that giant monsters from another dimension would occasionally rise from the ocean depths and try to kill us. What the movie didn't have time to explore in depth was just how much this changed society. I know you're busy managing all my vital bodily functions and keeping me alive. You have a pretty full schedule, and I understand this. However, you have another duty as well, and lately you've been dropping the ball. I'm trying to remember something important, and when I ask you about it, I get nothing. Look, I don't need to recall a long list of obscure Simpsons quotes from the 90's. I don't need to know the lyrics to the Fresh Prince of Bel-Air theme song. I don't need to know the order of the planets, the colors of the rainbow, or the recipe for banana bread. Don't get me wrong, that's good information to have when I need it, but I don't need it right now.